Agilent Technologies have expanded their Acqiris high-speed digitiser product line with extended functionality on their PXI digitisers. Both the U1061A and U1062A, 8-bit and 10-bit digitisers, now feature an optional high impedance mezzanine, making these devices suitable for combination with a signal probe in ATE applications, such as telecommunications and semiconductor component testing. The U1062A digitiser is a10-bit, 4GS/s 3U PXI digitiser, with input bandwidths of up to 2GHz and acquisition memories of up to 256 MS/ch. It reduces testing and data-acquisition time, making the digitiser suitable for high-speed ATE applications, where test time should be limited only by the speed limits of the device under test (DUT). The dual-channel 8-bit U1061A digitiser, with up to 1GHz of instantaneous bandwidth, provides synchronous sampling on both input channels of 1GS/s with up to 8MS of acquisition memory. 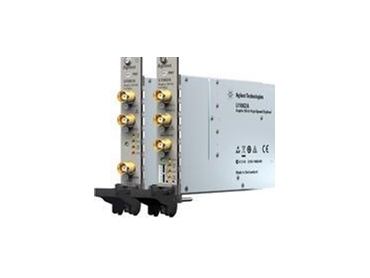 In single-channel applications, both digitisers provide the possibility of channel interleaving. Either channel can be selected or the ADCs interleaved, providing 2GS/s and 16MS memory (U1061A) or 4GS/s and 512MS (U1062A). The new high-impedance front-end, which enables high-voltage measurements on both U1061A and U1062A digitisers, uses programmable front-end electronics to provide a set of input voltage ranges from 50mV to 5V full scale into 50Ohms, and up to 50V full scale into 1 MOhm impedance. With a bandwidth into 50Ohms of 1GHz for the U1061A and 1.4GHz with the U1062A, using 1MOhm impedance results in a bandwidth of 300MHz. The amplifier response is optimised, with switchable filtering and fast recovery from out-of-range signals. The U1061A and U1062A digitisers are compliant with both the PXI and CompactPCI standards, and are supported with AcqirisLive and AcqirisMAQS software and Windows(r), Linux, and VxWorks drivers for easy integration into production test and automatic test equipment (ATE).